Hey, 357 Magnum fans! If you are looking for some great ammo for self-defense, then you should check out these great rounds, by Fiocchi! Fiocchi's jacketed hollow points are accurate, consistent, lethal, and affordable. All the thing you require of a self-defense round. The 158 grain JHP bullet is actually Hornady's XTP bullet. This means that you get an excellent projectile, which has proven stopping ability, loaded by an Italian ammunition manufacturer, which also charges a little less. This really does make this ammo great for buying in bulk and storing up. And an added bonus for the hunters out there, this round can also be used as an effective hunting round, inside of about 100 yards. Fiocchi has been producing ammunition for private gun owners and government agencies since the late 1800s. Each one of these great rounds is brass cased, boxer primed, non-corrosive, and reloadable. We don't have any reviews yet for this particular .357 Magnum ammo from Fiocchi. If you'd like to be the first to review this particular .357 Magnum ammo from Fiocchi, fill out the form below. 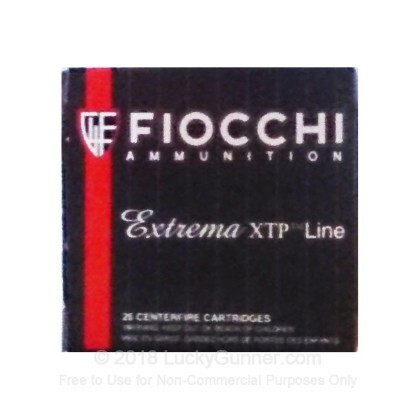 We also have this 357 Mag - 158 Grain XTP JHP - Fiocchi - 25 Rounds ammo in stock in a smaller quantity.